If you were to ask, “What does a smart mirror do?” our answer would be, “It depends which one you’re talking about.” These Wi-Fi- or Bluetooth-connected devices often have varying features and different degrees of smartness. 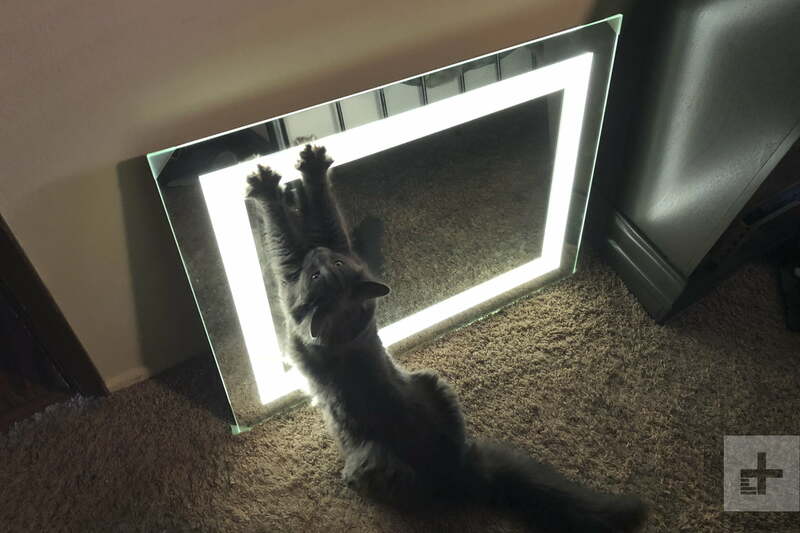 We tried out a few to see how magic a mirror can be. Hearing a luminous baritone randomly coming from your bedroom when you’re home alone is disconcerting. Luckily, it wasn’t an intruder. The Viio Vezzo smart mirror had just randomly started blaring the audiobook we were listening to thanks to its Bluetooth connection. As we were attempting to assemble a chair in the living room at the time, it wasn’t a welcome switch. The Viio Vezzo’s LED light isn’t adjustable in terms of brightness or color, so what you get is a soft, warm glow. The sound quality of the smart mirror is fine, considering most users will probably be listening to morning news or music that’s interrupted by gushing water from the shower or sink. It’s meant to be hung in the bathroom, since one of its three main buttons is an anti-fog feature. On the front, there’s also the Bluetooth pairing button and one for the LED lights. Under the mirror, there’s a charging port, audio port, power button, and microphone. The microphone is for phone calls, so you can chat as you curl your hair or trim your beard. The Vezzo comes in a few sizes, including a 30-by-30-inch round version ($445) and a not-quite-full-length 24-inch-by-64-inch model ($695). We tested out the 24-by-32-inch rectangle ($395). The LED light isn’t adjustable in terms of brightness or color, so what you get is a soft, warm glow. 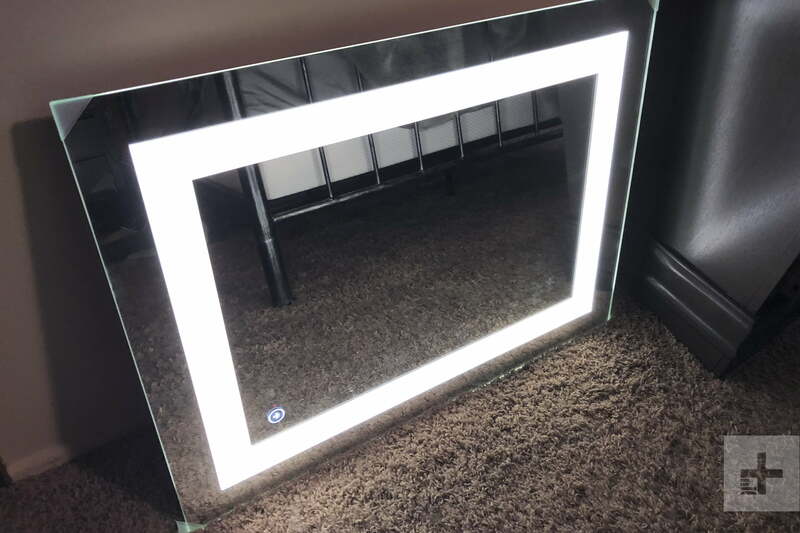 The mirror can run for about six hours on a charge, but since you don’t want to move this 24-pounder around, you’ll want it to live near an outlet. Having that dangling cord sort of ruins the aesthetic. As a teen, we had a friend pass on some advice from her dermatologist: never look at your pimples in a magnified mirror, because they’ll look far worse than they are. Now that we’re older, we can see how magnification might make mountains out of moles and craters out of crow’s feet. Still, it’s valuable for certain grooming tasks and for those with vision issues. The simplehuman Sensor Mirror Trio ($300) is an 8-inch mirror encircled by a dimmable LED, and it has 1x, 5x, and 10x magnification. 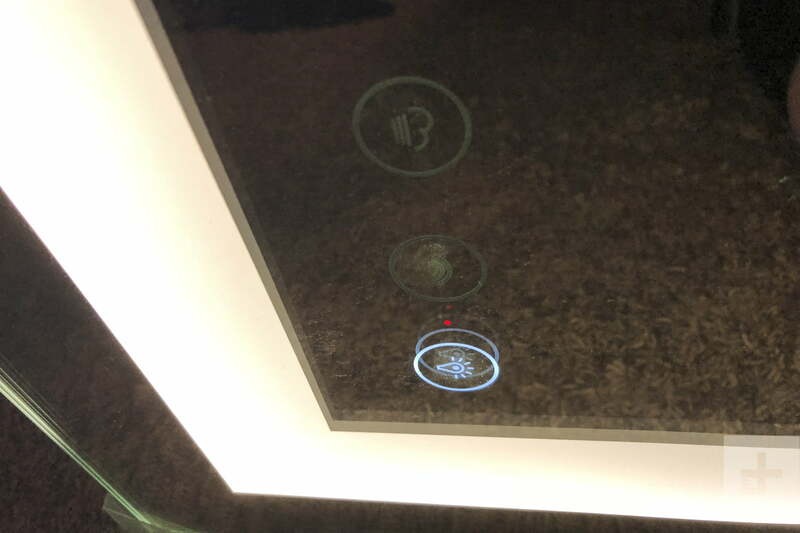 The mirror has a motion sensor that detects when you’re near and illuminates (you can turn this feature off). The LED mimics either sunlight or candlelight, and you can control the brightness by sliding your finger up and down the light. We found the LED can be a bit too dazzling if it’s on too brightly. There’s a charging port, and our Trio continued to light up for about four weeks on a single charge. This means you can move it from the bathroom to the bedroom or kitchen without needing to plug it in. Unfortunately, after a few weeks, the mirror started flaking where the 1x met the 10x magnification section. 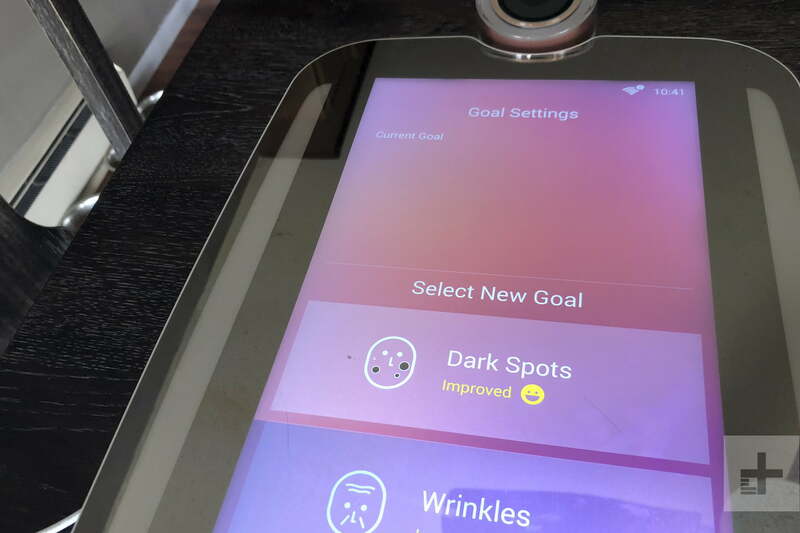 The company makes a few other mirrors, including the Sensor Mirror Pro ($250). Similar to the Trio, it’s an 8-inch mirror, though it only has 5x magnification and a stick-on, 10x magnifier. But this version is smart, so its LEDs adjust to more colors. If you take a picture of yourself at work and save it to the simplehuman app, your mirror can mimic the lighting, giving you a better idea of how your foundation will look under those unflattering fluorescents. The Pro also works with Nest cameras, so the LEDs can change to whatever light the camera senses, and Amazon Alexa, so you can ask the voice assistant to brighten or change color on the mirror. 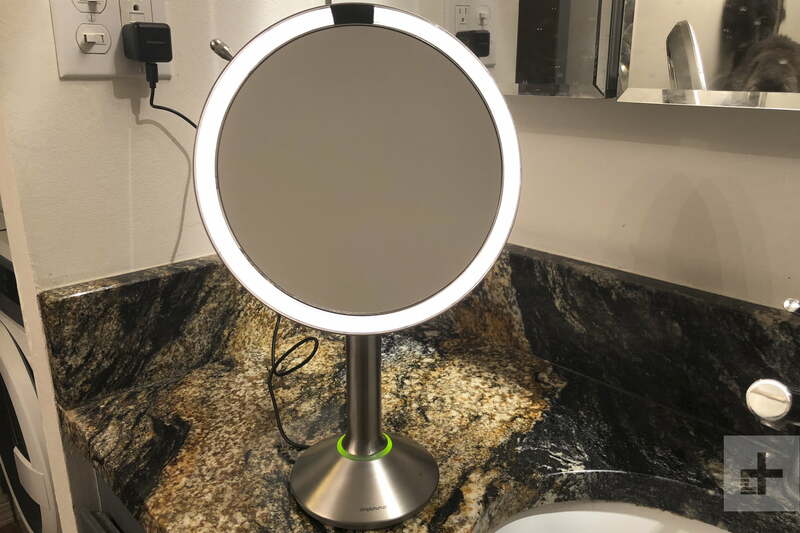 If the simplehuman Sensor Mirror Pro seems a bit makeup-centric, the $269 HiMirror Plus+ (plus plus? Extra plus?) is all about skin. Take photos of yourself with its built-in camera, and it will score you based on your pores, red spots, dark spots, wrinkles, fine lines, roughness, and dark circles. Take a few mirror selfies over the course of several months, and you can see if your new expensive moisturizer is having any effect. That’s the idea, anyway. The bathroom is a logical choice for smart mirrors, but it’s also a room most probably don’t want cameras or microphones. This is the one mirror we tried that has a camera, which isn’t the first thing we’d choose to stick in our bathroom. Fortunately, there’s a way to physically shutter the mirror’s all-seeing eye. It’s app-enabled, so it connects to your Wi-Fi. 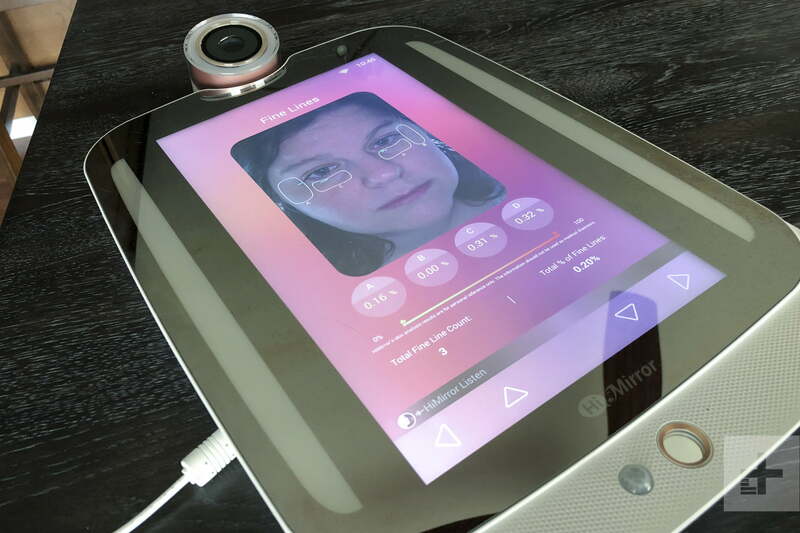 It uses facial recognition to unlock your profile, so our friend wasn’t able to see that our face is 3.34 percent fine lines when he gazed into the HiMirror. The scoring system is a little opaque. You’ll get a number from 0 to 100 but also the percentage. Our fine line score was 96.66, which translates to the percentage of our face that’s unlined. The HiMirror also highlights your pores, lines, and spots with blue lines and dots. To get an honest — if harrowing — evaluation, you’re supposed to go through this process makeup-free. Some features, like historically tracking your skin’s progress, require uploading your selfies to HiMirror’s cloud. You’re also supposed to be able to keep track of what products you’re using by using the app’s barcode scanner, but it didn’t recognize our Kiehl’s moisturizer or Neutrogena face wash. The Plus+ has Alexa built in, so you can use the mirror to hear the weather, set a timer, and so on. It can also link to your Spotify account. The mirror’s gesture control is unreliable, but you can use voice commands or a remote to navigate as well. The idea is you’re not meant to smudge up the mirror with your fingerprints, which is a nice (lack of) touch. The surface is also a screen, so you can see your scores on it, but you can also get your scores on the app. This bulky mirror needs to stay plugged in, so you’ll want to think about placement before you hang it up. 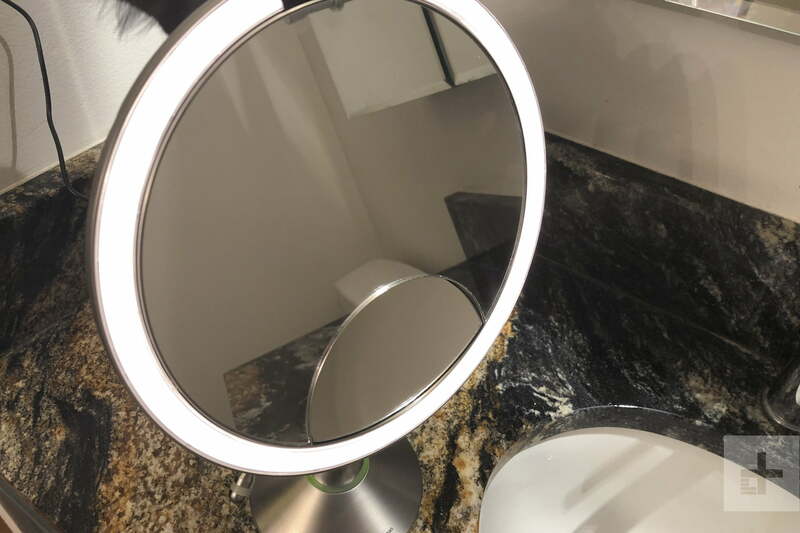 Each of these mirrors costs more than $250 for varying levels of “smart.” All of this begs the question of whether anyone really needs a smart mirror. The bathroom is a logical choice for hands-free options, but it’s also a room where many people probably don’t want cameras or microphones. The HiMirror is probably the closest to what people think of when it comes to a “smart mirror,” but it’s not all that customizable. You can watch some YouTube videos on it, but only curated ones, for example. It tells you the weather, but you’ll need to go through Alexa to get traffic updates. For now, it lacks the sort of “my mirror is also a big tablet” approach some are aiming for, and it also doesn’t have the augmented reality other options promise. The smart mirror space is still relatively new, and none of these offer the beauty and brains that would earn them a permanent spot on our wall or sink.If you were to ask, “What does a smart mirror do?” our answer would be, “It depends which one you’re talking about.” These Wi-Fi- or Bluetooth-connected devices often have varying features and different degrees of smartness. We tried out a few to see how magic a mirror can be.